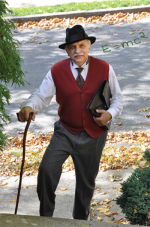 George Capaccio returns for part two of the wildly popular performance, Albert Einstein: Relatively Speaking! For many people, the name “Einstein” is synonymous with scientific genius and intellectual greatness. His insights into the ultimate unity of space and time, and his revolutionary concept of gravity certainly qualify him as one of the greatest minds of all time. But his passion for science was matched by his commitment to social justice, human rights, and worldwide disarmament. During the 20s and 30s, Einstein’s public opposition to war — in addition to his scientific notoriety — nearly cost him his life in Nazi Germany and forced him to seek refuge in America. In this performance, George will focus on Einstein’s later years as an outspoken “rebel with a cause.” As a “reluctant superstar,” Einstein was never entirely comfortable with his celebrity and the frequent invasions of his privacy. However, he used his fame and the stature he had achieved to advance causes which had always been dear to his heart, including the abolition of war and the creation of a supra-national government that would keep the peace among nations. With the advent of World War II and Hitler’s rise to power, Einstein did everything in his power to help Jewish intellectuals leave Germany and find refuge here. Although he alerted President Roosevelt about Germany’s progress toward developing an atomic bomb, he played no role in America’s actual creation of this weapon. During his years as a naturalized American citizen, Einstein served as the Chair of the Emergency Committee of Atomic Scientists. In this role, he worked to educate the public about the dangers of atomic weapons. He was also a passionate opponent of racism and a close friend to two of the country’s leading African American artists—Paul Robeson and Marian Anderson. “Albert Einstein: Reluctant Superstar” will introduce audiences to the great scientist’s principled stand against injustice and the price he paid for his unwavering devotion to humanity. The performance will begin with a brief recap of his stunning scientific breakthrough in 1919 when his general theory of relativity was confirmed. News of his triumph brought him worldwide acclaim and the status of a “superstar” in the eyes of the public. Capacity: 36 of 60 spaces available.